A portion of the School to Prison Pipeline story map made by Prof. Lisa Armstrong’s class Gender, Land, and Food Movements in the fall of 2015. Although embedded deeply within the Sciences at Smith, the Spatial Analysis Lab routinely crosses boundaries to work in other domains. One recurring theme is mapping justice and the typical focus is environmental justice given our grounding. But more recently our attention is drawn to issues involving social/economic justice and inequality. Much of our work in this area is attributable to work with Lisa Armstrong’s Gender, Land and Food Movements (SWG230) class, although we have touched on these issues in several other classes over the years. 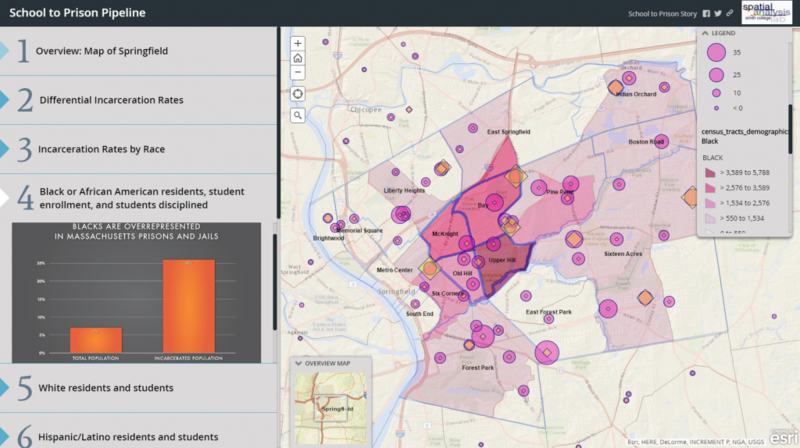 We learn how to apply our tradecraft, cartography and spatial analysis, by working with, and teaching students to apply a geographic lens to community problems. One such problem addressed in SWG230 is the school to prison pipeline in Springfield, MA. How can mapping this issue benefit the community? How do you conceive of such a map? These are questions that students must grapple with to design an effective map. As we finish work on the 3rd iteration of this class we seek to apply and to expand the application of our work to map various forms of injustice. These interests intersect with Smith’s recent Innovation Challenge which sought proposals to support research, teaching, and learning programs built on themes of inclusion, diversity and equity. We proposed to build a community of practice consisting of faculty, students, and staff that were informed about the power of the map. This community would learn together to create maps and spatial narratives that become agents of change. Unfortunately, our proposal was not funded, but these efforts will continue in some capacity. We recently joined the Undesign the Redline project sponsored by the Knowledge Lab in Neilson Library. We plan to collaborate and provide our expertise to map and document past injustices. Our efforts will include workshops that teach mapping techniques that can empower communities to change unfavorable practices and policies. We also hope to bring in scholars and practitioners from the larger mapping community that can guide our ongoing development to illuminate the geographic structures and processes that perpetuate landscapes of inequity. There is more to do and plenty more to come from the Spatial Analysis Lab. Stay tuned for news on a recent conference that featured inspiring talks on women in historic cartography projects and diversifying women in the field of digital mapping.